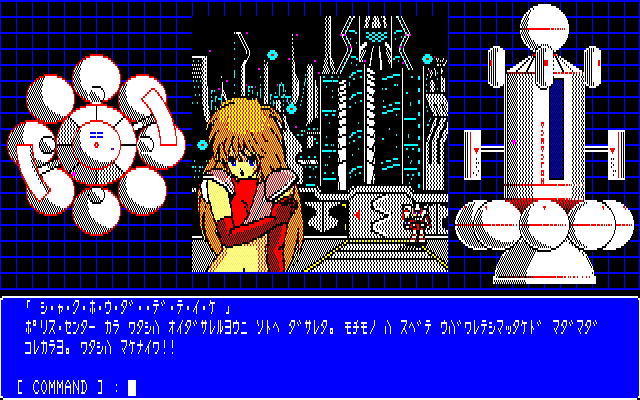 「ALPHA 」is a Science Fiction adventure game developed by SQUARE (now SQUARE-ENIX) for most of the Japanese PC platforms of the 80's. 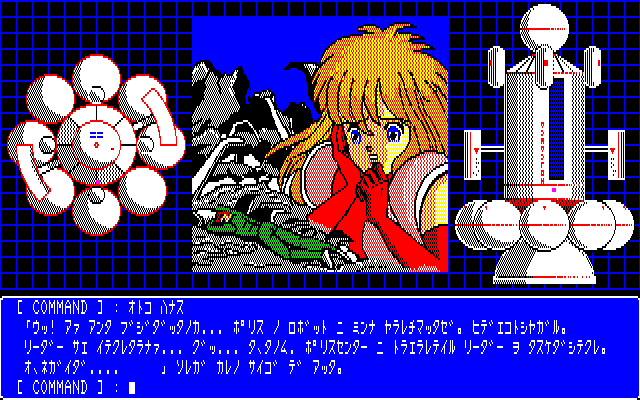 The game is among the most popular adventure games of its generation and is best remembered for its by then advanced animation as well as for its lovable scantily-clad heroine「CHRIS」. 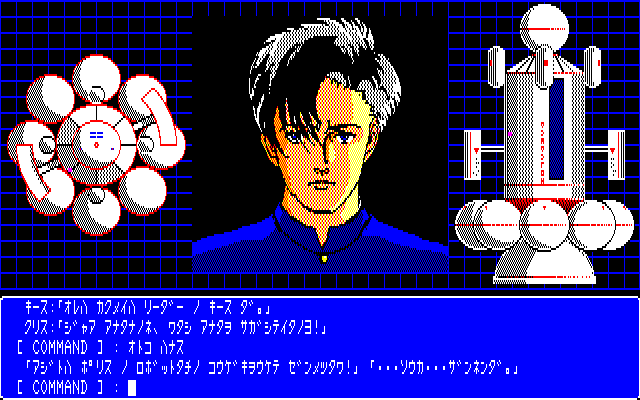 ALPHA is the third and final adventure game that SQUARE developed for the Japanese legacy PC systems. Released after「THE DEATH TRAP」(1984), and the far more successful「WILL : THE DEATH TRAP II」(1985). ALPHA is easily the more accomplished game of this trilogy, although of course this sort of had to be expected since it was released last after all. within the adventure genre. 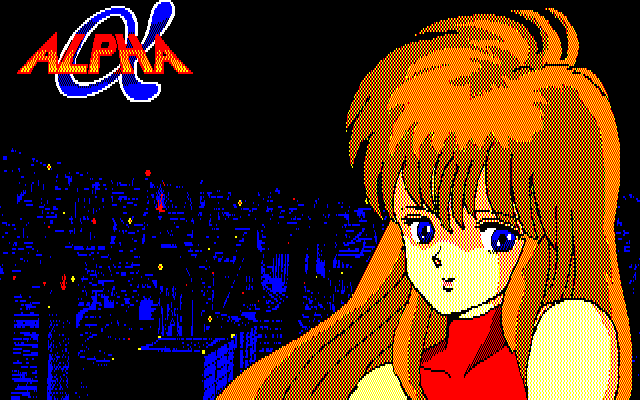 While SQUARE was nowhere near as prolific within the adventure genre as their now partner ENIX was, their contributions were certainly none the less relevant. WILL for example, will always be remembered as the first Japanese-developed adventure game that implemented animated graphics. 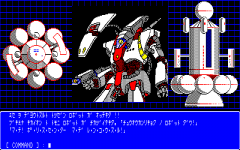 Of course the animation itself as well as the graphics were extremely rudimentary, as you can imagine from a PC game of that time. 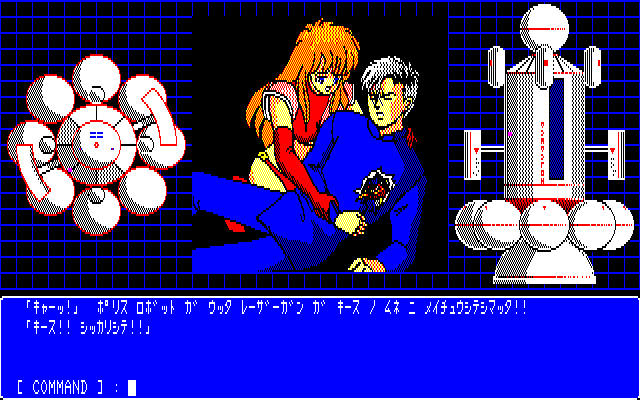 Yet, it goes without saying that they earned the game some major critical and commercial success at the time. As a matter of fact WILL managed to sell over 100,000 copies (an impressive number within the PC gaming community of the time), so the game also holds the notable distinctions of being SQUARE's very first commercial hit as well as one of the best-selling PC games of the period. 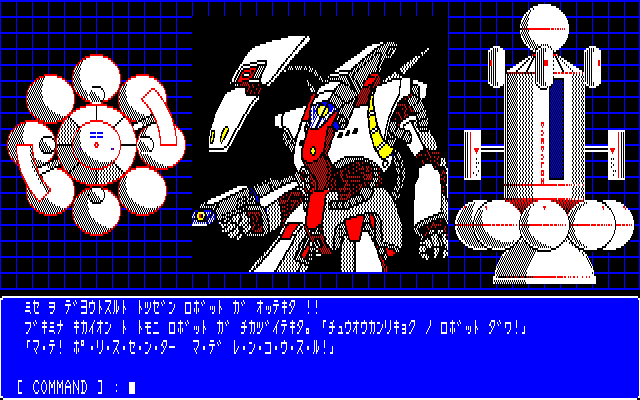 Just like its predecessor, ALPHA was also a high-profile release. 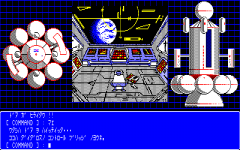 I'm pretty sure the game boasted some of the best graphics and animation the genre had to offer up until that point in time (1986). 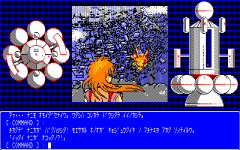 However, by the time the game was hitting the shelves the adventure genre was already in the middle of a relevant generational transtion, and in just a short while even the most stellar of the Oldtype adventure games (where ALPHA and the rest fall in) would become just too antiquated in comparison to the inherently superior new generation of adventure games. In 2101 A.D. taking millions of immigrants on board the first interstellar starship「DAEDALOS」left home to its planet ALPHA. People knew that they will not live to see ALPHA, but their hearts were full of hope for the new frontier. A few centuries have passed away. None of the initial crew are still alive. Not knowing what they are for, their children live without dreams, without hope. Upon the hills, standing a girl, with her hair flowing in the breeze. She knew nothing, nothing but her name... CHRIS. The game starts just like the intro told us with CHRIS standing upon a hill. Suddenly, an explosion occurs in a nearby stadium. Apparently a revolution of sorts has started. Lots of stuff to steal too : An energy pack, a timer, an oxygen mask... Yep, the usual stuff you'd find at a convenience store in a spaceship. The question is : where does she hides all this stuff? 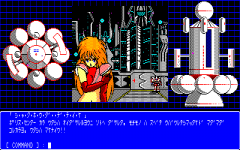 Ever since the ENIX game「ZARTH」came out in 1984, it became sort of fashionable for adventure games to have an「impactful scene」, mainly for promotional reasons. 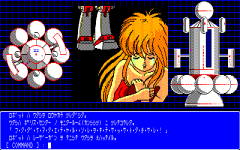 The「Chained Scene」became ALPHA's flagship scene and to this day most people, even those who never played it, probably remember the game because of it. You will get to see this scene at the very least 4 times throughout the game though, so its shocking value does diminishes a lot. While roaming the streets CHRIS gets ambushed by the revolutionaries. After talking a bit with their sub-leader「ARNOLD」the robot police shows up and CHRIS gets sent back to jail. When CHRIS goes back to the revolutionary hideout she is shocked to discover that the robot police had massacred everyone. Before dying a revolutionary tells CHRIS that their leader has been taking captive and now she alone is his only hope. CHRIS has devised a plan to break into the police center but first she must get herself arrested (yet again!). There's a limit to the kind of abuse someone can take and CHRIS has reached hers. Finally those damn robots go what they deserved! After successfully breaking into the police center CHRIS finally meets the revolutionaries leader「KEITH」. 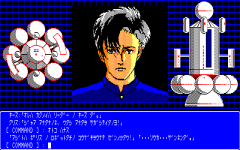 The DAEDALOS main computer which was originally programmed to monitor the well-being of all the people on board the ship became haywire at one point during the long journey to planet ALPHA. 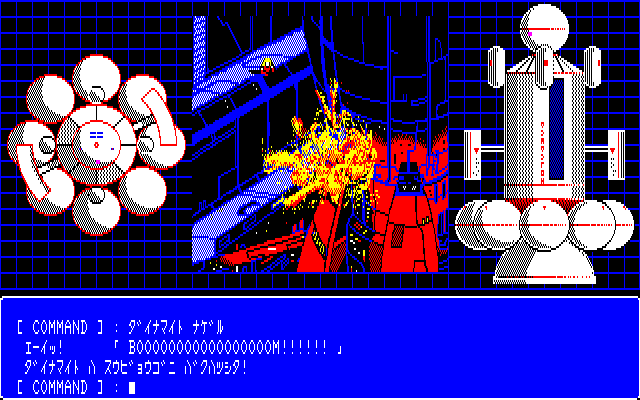 In order to preserve and prolong its own existence, the main computer sabotaged the ship's navigation system thus effectively preventing it from ever reaching ALPHA. The human population then became little more than slaves used by the main computer to maintain the ship. KEITH then explains that in order to free the people and reach ALPHA, the main computer must be destroyed. That is the true goal of their revolution. Unfortunately as CHRIS and KEITH were about to make their escape they are stopped by the robot police. CHRIS manages to fight off the first batch of robots but her laser gun runs out of energy. To make matters worse KEITH (who turns out to be an android) is mortally wounded during the fight. Before dying KEITH gives CHRIS the「Gold Key」which will grant her access to the various computer mainframes around the ship. Afterwards CHRIS finds herself back in jail (for the 4th time now!). Strangely-enough given the circumstances, the police lets CHRIS go. CHRIS is now determined to destroy the main computer, but first she needs to gear up. At the revolutionary hideout she finds another laser gun as well as some dynamite. 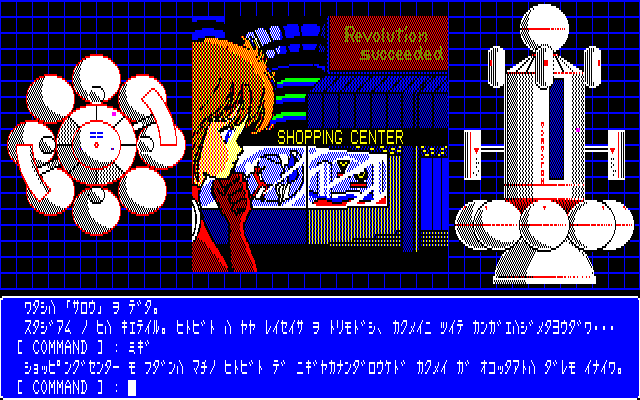 The laser gun has no charge though, so she goes back the shopping center to pick up an energy pack and and a timer for the dynamite. From this point on the game can get very frustrating unless you know exactly what you're doing or are following a guide. The problem is that you will have to go through various hallways, elevators, and car stations that are supposed to be different places but look exactly the same. It is incredibly easy to mess up during this part so just make sure you're moving the right way. Anyway -- CHRIS' goal now is to infiltrate the various computer mainframes and retrieve the key cards necessary to enter the main computer area. Finally, CHRIS finds herself in front of the main computer. Just like that the main computer is history! Back on the streets, signs of「REVOLUTION SUCCEEDED」can be seen all over the place. There's still the matter of reaching planet ALPHA though, so CHRIS heads off to the bridge. The bridge is guarded by another group of robots and one of them drops an interesting-looking magnetic key card. Unfortunately the bridge door is password protected, so CHRIS is forced to look for another way in. Damn you main computer ! But the good news is that it is only a matter of landing now. Hmmmm, what's this...? A password... 「ICARUS」 ...? The password worked and CHRIS gains access to the bridge. When DAEDALOS first left Earth, the two androids「CHRIS」and「KEITH」were put on board as a sort of security fail-safe protection. In the event that some anomaly occurred, the androids are supposed to wake up and restore order. So basically this tells us that CHRIS and KEITH just acted in the way that they were pre-programmed for. Aftewards, CHRIS pushes the landing button and DAEDALOS readies for atmospheric entry. ALPHA unfortunately has all of the flaws that are inherently associated with Oldtype adventure games : It is very short, lacking in content, and very difficult to complete without a guide. Yet you really can't blame the game or SQUARE since well, that's how adventure games used to be before the genre evolved. 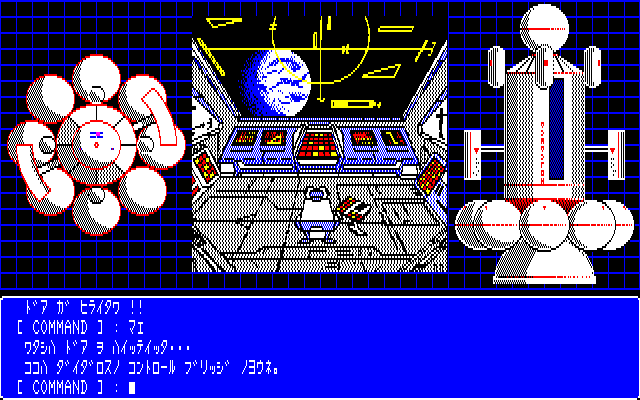 ALPHA is really one of the last stellar Oldtype adventure games that came out, so I personally prefer to look at it as one of the finiest examples of the Oldype style rather than as a sub-par or antiquated adventure game. In the past PC game packages were truly the stuff of wonders. Originally ALPHA came packaged with a promotional phonosheet containing two BGM tracks composed by the now worldwide famous composer「NOBUO UEMATSU」. Yes, there's a couple of guides out there, but unless you're used to play these old type adventure games it might be hard to follow. It is a command by command guide so just do exactly as it says and you should be able to clear the game. The actions marked by an * are just to see the easter eggs and aren't required to advance in the game.